HomeENVIRONMENTGlobal Air Quality UNFIT Per WHO, Are Chemtrails To Blame? Global Air Quality UNFIT Per WHO, Are Chemtrails To Blame? Global Air Quality UNFIT Per The WHO — Are Chemtrails To Blame? The World Health Organization (WHO) published that confirmation of air quality in a press release issued September 2, 2016. Heck, I could have told them that years ago without performing any studies or quality models just from looking at skies overhead and seeing ‘sky graffiti’ that spreads out into ‘blanket clouds’, which make sunny days dark, dreary and dreadful of what’s falling to earth—the particulates we humans are forced to breathe. Question: Do the ‘clouds’ in these photos look like anything Mother Nature would provide? Furthermore, what kind of ‘flight plans’ do those chemtrails represent? Even a Kamikaze pilot could do much better, I think. What is air pollution’s toll on humans? So why, then, are global governments and corporations  engaging in Solar Radiation Management (SRM) and other weather geoengineering practices that absolutely contaminate the air that all forms of life on Planet Earth are forced to breathe? Manipulating weather is not some two-bit endeavor: Numerous ‘resources’ obviously become engaged and deployed, the least of which are chemicals, gases, machinery and technology. Someone has to foot the bill for that and ‘underwrite it’ too! Who’s financing the polluted air we breathe? Do you think the WHO knows? How about the U.S. Congress; does it know and if not, why not, and when will it find out? Apparently, the weather geoengineering rabbit hole really is very, very deep! I’d say the above information sure sounds like an incredible roster—plus tonnage—of toxins being sprayed into the atmosphere, which creates the air pollution we breathe in a much greater proportion than what the WHO wants to blame it on: transportation modes, household fuel, waste burning, coal-fired plants and industrial activities, even though those ‘offenders’ provide a tremendous amount of air pollution. However, why deliberately spray more toxic clouds and pollution on humans like we are some sort of roaches to be gotten rid of? Incidentally, the WHO has another website, “BREATHE LIFE” , which states “air pollution is an invisible killer,” so why, in the name of all that is common sense, isn’t the WHO doing something about stopping chemtrails? Good question? Or, are they playing some sort of shell mind games with us about air pollution to fit in with some specific agenda? About the Author: Catherine J Frompovich is a retired natural nutritionist who earned advanced degrees in Nutrition and Holistic Health Sciences, Certification in Orthomolecular Theory and Practice plus Paralegal Studies. Her work has been published in national and airline magazines since the early 1980s. Catherine authored numerous books on health issues along with co-authoring papers and monographs with physicians, nurses, and holistic healthcare professionals. She has been a consumer healthcare researcher 35 years and counting. 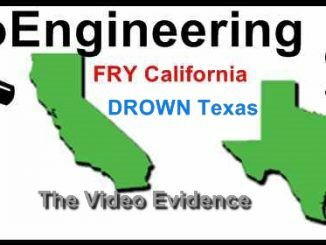 Evidence: “They Own The Weather”… But Not Texas!